Gerrit Cole went over 200 innings with a sharp outing against the Baltimore Orioles, and Houston got a home run from Josh Reddick in a 2-1 victory Friday night. BALTIMORE (AP) — Gerrit Cole knows the 2018 season will ultimately be judged on how he performs in the playoffs. So for at least a week, the Houston Astros right-hander will savor what he accomplished from April through September. 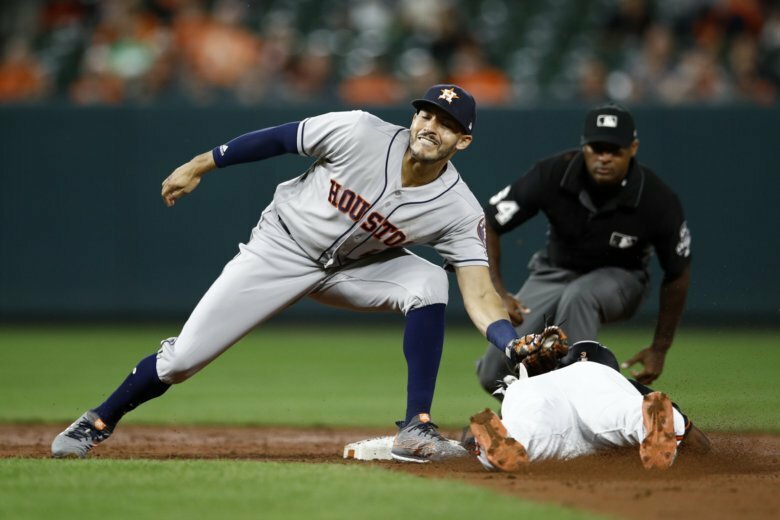 Cole went over 200 innings with a sharp outing against the Baltimore Orioles, and Houston got a home run from Josh Reddick in a 2-1 victory Friday night. The Astros close out the regular season at Camden Yards this weekend after clinching the AL West title on Tuesday night. Houston opens the playoffs at home against Cleveland on Oct. 5. Cole gave up one run, five hits and a walk over six innings. His four strikeouts gave him 276 for the season, and he finished with 200 1/3 innings. Although Cole wasn’t involved in the decision, he will enter the playoffs with a 15-5 record, a 2.88 ERA and a five-game winning streak. Manager A.J. Hinch couldn’t have been happier with the way Cole pitched this season. Cole and the Astros trailed 1-0 in the sixth before Reddick tied it with his 17th home run, a drive off rookie David Hess that sailed over the right-field scoreboard. Marwin Gonzalez put Houston in front with a bases-loaded single in the eighth off Tanner Scott (3-3). Tony Sipp (3-1) and Collin McHugh each pitched one inning before Roberto Osuna worked the ninth for his 21st save. He’s 12 for 12 since coming to the Astros from Toronto in late July. The game ended with center fielder Jake Marisnick making a diving catch of a sinking liner by Renato Nunez with the potential tying run on second base. Hinch intends to talk to players about their status for the postseason on Sunday. With such a glut of talent on the roster, it’s likely that a handful of players will see their seasons unexpectedly come to an end. He plans to reveal his starting post-season rotation by the end of the weekend. Adam Jones was selected the Most Valuable Oriole in a poll of writers and broadcasters who cover the team. Jones is 33, his contract expires after this season and the Orioles are rebuilding with youth. So, these could be his last days in Baltimore. Many in the crowd gave him a standing ovation during each of his four trips to the plate. He responded with an RBI double in the first inning and hit a drive to the warning track in the ninth. The fans are unsure if Jones will be back, and so are his teammates. “To think it could be the end is sad,” catcher Caleb Joseph said. Orioles first baseman Chris Davis has apparently put an end to one of the worst seasons in major league history. Baltimore manager Buck Showalter said Friday that Davis — mired in a 1-for-37 skid — probably won’t play again in 2018. Davis will finish with a .168 batting average, lowest by a qualifier in big league history. The previous record was .179, by Rob Deer in 1991 and Dan Uggla in 2013. Astros: Justin Verlander (16-9, 2.60 ERA) and Dallas Keuchel (12-11, 3.75 ERA) warm up for the playoffs in Saturday’s single-admission doubleheader. Orioles” Dylan Bundy (8-16. 5.49 ERA) puts an end to a disappointing season, and rookie Yefry Ramirez (1-7, 6.07 ERA) seeks his first win since July 24.